When you see the word “culture”, what comes to mind? That is pretty close to what Merriam-Webster would say. What if I were to say “bike culture”? Hell’s Angels, Moab, Lance Armstrong, a dark gray blob growing on the seat of your bicycle, never mind. Of course I don’t mean any of those. I’m thinking of a city or a town, maybe our town, where a very common mode of transportation is bicycle. People commute to work on bikes, run their errands on bikes. People are out everywhere playing on their bikes. There are fun bikes to look at everywhere, vintage bikes, custom cruisers, high performance road and mountain bikes. A town with bike culture would have bike racks in front of businesses, plenty of bike lanes and paths to get anywhere you want without fear of being run over by those large speeding metal boxes. There would be regular bike events taking place that would inspire locals and visitors alike to get on their bikes and maybe even take part in the event. Hopefully it wouldn’t have the opposite effect like our most recent event where not very smart riders try to ride two or three abreast in a lane made for single wide. This only serves to upset drivers and endanger riders and put a bad taste in everybody’s mouth. Hopefully the organizers of that excellent event can just encourage better manners from the participants because that is part of culture (better manners) and that will help to keep everybody happier. A town with bike culture might even have a little bike history of some sort. 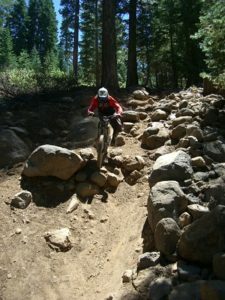 We actually do have a little mountain bike history, albeit not very well known, but we built some of the very earliest mountain bikes right here in South Lake Tahoe, but that’s another story. We have recently been given the designation of a “bicycle friendly community” thanks to the work of Ty Palstri and others, and I would agree that most of our community is bike friendly, except for the highway 50 corridor! Maybe as we grow our bike culture and more people get out of their cars we will be given one or two of the five lanes on highway 50 through town just for pedal powered transportation! We have also just had bike to work week. This of course is a nation wide event and that is wonderful but what is that! Bike to work week? How about at least bike to work month, or bike to work summer. We did have pretty good results as far as rider numbers for that week and I am sure some of those riders got hooked on the niceness of arriving at work on a bike and will continue to do so. If anything good were to come out of the high gas prices it might be that we get more of us out of our cars. Alternative fuels, yeah like a good whole grain breakfast! It seems to me that one of the biggest hurdles that new bike commuters have to overcome is the “I have to look and dress a certain way for work” thing. Well this is a huge part of bike culture too. When a community is more accepting and aware of the clothing needs and the safety needs and the carrying capacities of bicycle commuters, it becomes much easier to deal with life by bike. If everyone in an office commutes by bike, and many of the clientele arrive by bike, then who will care about a little helmet hair, everybody will have it. New bike commuters will also have to learn other small adjustments like how to carry their daily needs on a bike, and time adjustments. It may take a few minutes longer to get there, but in a town this small on those congested summer days it may not take much longer at all. But when you do arrive at work or the store or wherever it is, you always feel better than when you arrive by car. And at the end of a work day you look forward to getting off and riding home, again with the result of feeling better than driving can make you feel. Something strange always happens to us when we drive a vehicle in congested or hurried conditions, it always changes our mood and it never seems to be an improvement. This means a town with bike culture will be full of happier and of course healthier people. And you want to talk happy, I love the feeling of riding by a gouge station or I mean gas station where someone is filling up their seventy dollar gas tank! Our town is so perfect for and has such a need for real bike culture. The truth is we have a bike sub culture right now. When I think about some of the regulars that we see daily, the tandem couple, the chopper guy with those ape hanger bars, Daniel doing recycling on his three wheeler, Karen Fink who has never owned a car, Darla Mazzoni and Ted Truscott teaching classes, adventurer/writer Rick Gunn who is out on his two year around the world odyssey, and so many others that do ride to work everyday. We have a few of the coolest, most fun small bike shops you can find anywhere, Alta Alpina cycling club, The Slow Rollers Cruiser club, an awesome BMX track, more and more huge jump trails showing up all the time, (take a minute to check these folks out sometime if you ever come across some), our own small and very friendly monthly critical mass rides, Americas most beautiful bike ride, and coming up the Death Ride/tour of the California Alps. We have two ski areas offering lift access down hilling and quite simply some of the best mountain bike riding anywhere! So step out of the car and back away slowly, swing a leg over a bike and let’s grow some more bike culture this summer! 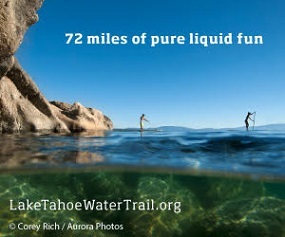 The Spoke Junkie is a regular columnist for the Tahoe Mountain News.